For those seeking luxury top-of-the-line festival amenities, the Patron and VIP Experiences are highly recommended. Equipped with everything from on-stage viewing platforms, to one-of-a-kind culinary and cocktail menus curated by Telluride's top restaurant personalities, along with stage-front seating, these experiences are unmatched. Patron Pass holders enjoy an elevated view of performers on stage! The Patron Experience is by far the best way to attend the Telluride Jazz Festival! 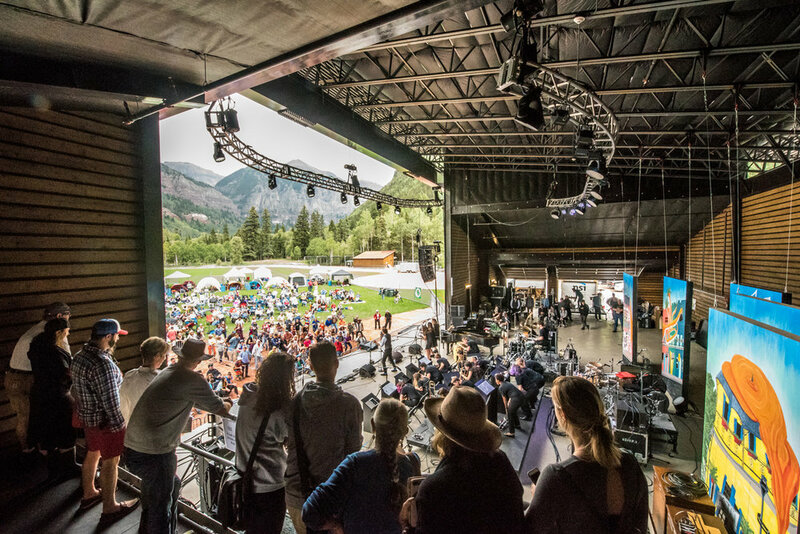 With an on-stage seated viewing area and catered meals alongside the artists backstage, Patron pass-holders will be treated to a weekend of world-class music, decadent food and drinks all surrounded by the unparalleled views of Telluride Town Park. Patron Passes include a charitable donation to The Telluride Society for Jazz, a nonprofit 501(c)(3), and supports music education and artist workshops throughout the festival. As such, a $400 of the ticket cost can be deducted on income taxes as a charitable contribution. The VIP Experience features an exclusive VIP area inside the Festival grounds with a covered, heated lounge with unobstructed stage views, seating in front of the stage, a hosted bar with craft beer, select wine and specialty cocktails, private, up-scale restrooms and more! Want the VIP Experience and access to all of the late night "Jazz After Dark shows? Check out the "All That Jazz" VIP Pass! Jazz After Dark at the Sheridan Opera House! "All that Jazz" is your ticket to the complete weekend package of live music at the Telluride Jazz Festival! Available in both General Admission and VIP levels, "All that Jazz" provides daily admission to the festival in Telluride Town Park and the "Jazz After Dark" shows on Friday and Saturday nights. After the music ends in Telluride Town Park, the live performances continue into the night at three indoor Jazz After Dark venues around town. These shows are a great way to see lively performances from festival artists in an intimate, up-close-and-personal setting. Our new late night format allows attendees to visit all three shows freely, instead of purchasing individual tickets on a show-by-show basis. Attendees enjoy the 2017 Festival headliner Mavis Staples! See all of the music on the Main Stage including Bruce Hornsby & The Noisemakers, Irma Thomas, Soul Queen of New Orleans, Karl Denson's Tiny Universe, Jaimoe's Jasssz Band, BADBADNOTGOOD, Turkuaz and many more. and enjoy access to a full cash bar, along craft retail and food booths. All Telluride Jazz Festival Passes come with free entry to the Telluride Historical Museum! Each day of the festival features a unique and dynamic lineup of performers and special events! If you can't make it to the whole festival, check out the schedule and find a day that's right for you! Jazz After Dark at the Liberty Bar and Lounge in Downtown Telluride! After the festival ends in Town Park on Friday and Saturday (August 3rd and 4th), the music will continue into the night at Jazz After Dark shows located around town in a selection of Telluride's best indoor nightclubs and historic venues. Once the "Jazz After Dark" series gets jamming, a walk down Main Street feels like a walk down Frenchmen Street in New Orleans. Here, you can catch your choice of acts in an intimate, up close and personal setting at three venues. Jazz After Dark passes allow access to all three venues for the night purchased. All venues are first come, first served and based on the capacity of each venue. After the shows begin, entry is dependent on capacity. Bundle and save, the 'All That Jazz' Pass and VIP 'All That Jazz' Pass includes entry into all Jazz After Dark Shows. The Patron Experience Pass includes entry into all Jazz After Dark Shows with early priority entry before other pass-holders. Enjoying the Telluride Town Park Campground! Pass includes 3 days of vehicle parking in the Telluride Town Park campground. Restrooms and hot showers nearby. All vehicle campers must have a Camping Pass and a Festival Pass (sold separately).